Originally designed as a target revolver, whose grip and hammer position was light years ahead of the old Colt, turned out to be popular as a workaday pistol in it's own right. Those who used it thought it to be faster shooting. Over 44,000 were built from 1894 through 1912. The Bisley model acquired it's name from the famed Bisley shooting competitions in the UK, which became the headquarters for Britain's National Rifle Association in 1890. 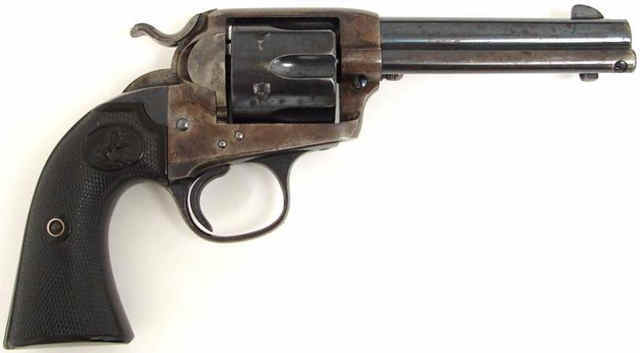 Colt introduced it's target model there in 1894 and it soon became known as the Bisley model. The first guns were flattop models with adjustable target sights... the front side blade was replaceable for different heights, and the rear was adjustable for windage. Soon however, those were overshadowed by fixed sight models, which would suggest gunfighting and ranch use, where a rugged pistol was necessary, although by the late 1890's I would think gunfighting days would be over. The grip and lower hammer would take some getting used to if you were a single action Colt shooter, and you would either love it or hate it. It's main advantage is keeping the gun from rolling up in your hand during heavy recoil. The late author Elmer Keith's famed No. 5 pistol is an adaptation of the Bisley model, as is Ruger's Bisley model, but with less extreme grips.